The full-featured professional genealogy program that helps you track, organize, print, and share your family history. Includes sourcing, reports, merging, To Do list, slide shows, multimedia, Web pages, spell checking, import and export and much more. And, it's FREE! 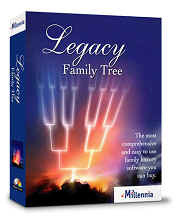 Developed for MyTrees.com this special version of Legacy Standard Edition allows you to search directly from the Legacy Progam to the world's largest pedigree-linked archives at MyTrees.com. Just select your ancestor and click the MyTrees.com Button. Enter your email address below. We need this to email you the password for installing Legacy 9.0 Standard Edition for MyTrees.com. Click Save File when the install begins.